When you have an FTD® Florists Online website, you can instantly move into another retail category - premium gift and gourmet - without purchasing any inventory. FTD WebGifts is a consumer direct service offering a collection of both floral and non-floral gift items for you to sell in your shop or on your website. Our partnership with leading gift and gourmet vendors will give you hundreds of items to choose from to sell on your website. We also offer a new collection of gifts for all major holidays each year. 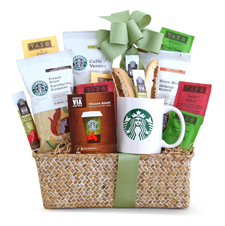 Plus, FTD WebGifts gives you access to sell premium branded gifts by Godiva®, Starbucks and more! For more information or to enroll, contact us at webgifts@FTDi.com.